Wow, we're almost there! This time next week our students will be counting the minutes/seconds until the buses roll out for the last time of the school year. As you wind down the last week with students I wanted to go over a few digital year end things that will make life easier for you and your students. 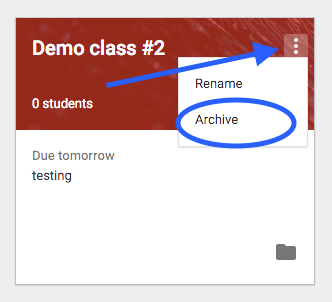 Archive your Classes in Google Classroom. By doing this the class is no longer visible to you and your students. You will still have access to the Google classroom assignments, streams, etc but it will not show up on your Classroom Dashboard. I really think that this is important to do and only takes a few seconds. Also, and of great importance it will remove the class from your students dashboard so they will no longer see it. There have been 2 new announcements this week about Google Classroom that you may be interested about. 1. If you would like to schedule assignments, questions, or announcements ahead of time you can! Starting this week, when creating an assignment, question, or announcement you have the option to assign at a later date. So, if you would like to go ahead and plan ahead now you can! Here is a image from the Google Classroom site that shows you how to do that. 2. Starting next school year parents can be a part of Google Classroom. Parents can choose to receive e-mails when an assignment, question or assignment is given to a student OR they can receive emails in a daily or weekly digest. If you have questions about these features please let me know. Good luck in the last few days of school. I am thankful to work with amazing teachers all over the county. Thanks for all you do. To get to this feature open up Google Docs, click on tools, and select Voice Typing. From here click on the microphone and begin to speak into your document. This could be a great feature for students to brainstorm or create a rough draft. Now using Voice Typing students can utilize almost any command. For a list of new features click HERE. Below is a video that demonstrates the new features of Voice Typing. If you have questions about Voice Typing please let me know and we can find a time to talk about this. This is a great way to Augment and Modify lessons with Google Docs. I have had several requests lately of places where Teachers and students can access primary resources. Below are some sites that may be beneficial to you and your class. If you have questions about any of these please let me know. Library of Congress - The Library of Congress has a digital collection that is really easy to view. There is no login required and all material is free. One of the things that I like about this is that they have rotating "Digital Collections" Students can see primary documents, pictures, video, and audio. Last week I blogged about using Voki in the classroom. Matt Smith, a 7th grade teacher at Burney-Harris-Lyons Middle School, decided to give it a try with his class and use it as Digital Closer for his students. HERE is an example that one of his students made Way to go Mr. Smith's class! That brings us to Redefinition.